Please check out the new wines that recently landed from Max Ferdinand Richter. We have received new vintages of the pradikat wines, and have added a new sku, the Graacher Domprobst Alte Reben, which is the first truly dry Riesling we have carried from the estate. We’ve attached some press summaries for the 2016 and 2017 vintages for your reference. The View from the Cellar has a nice introductory paragraph about the estate and some interesting comments confirming that this winery has really flown under the radar for quite a while. And the press from Wine Advocate and Vinous is amazing. 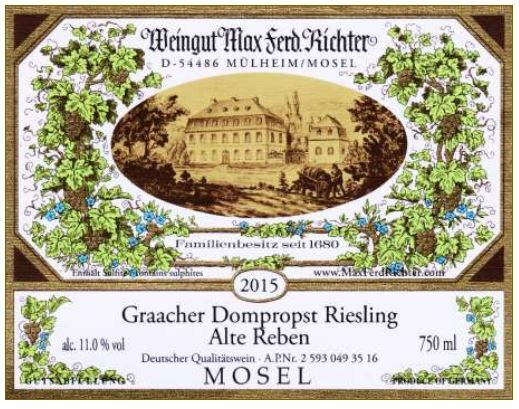 In addition to the great press from the US publications, Richter recently won (again) best Riesling Kabiinet for the 2017 vintage for the Wehlener Sonnenuhr vineyard in the German publication Gault & Millau Wine Guide, as well as best noble sweet Riesling for the 2017 vintage for the Brauneberger Juffer Sonnenuhr Riesling TBA. These are both very important milestones in Europe and Germany, and echo all of the accolades Dirk and Constantin are receiving for the wines in the United States.